Aquaria: That means fish, dude. Like many out there, I have been holding water as a lifelong hobby. Here is my take on the wet hobby, that seems to be growing into an art-form. Find me, dborowsk, on www.reefcentral.org or www.ebayfish.com. Ah, I remember it well. I was a kid in grade school. As a gift for my first communion, I recieved my first aquarium kit. A Hartz kit with the yellow and orange fish logo from Kmart. Following the suggestions from the books in the school and public library (because by then I had pretty much read them all), we sat the aquarium out overnight to test the seals. Sure enough, it had a small leak. My dad got a refund and returned with a new glass fish tank. I redundantly use the term glass, because, of course, in my hurry to get the item out of the car, the weight of the heavy car door to a third grader put me off balance, and the ten gallon hit concrete garage floor. After the tears, Dad took me to the store to use my own money for a replacement. Come to find out that a buck a gallon pricing really dried up the tears. So it began. I only had that ten gallon tank for most of my childhood. I started working at the pet store in our local mall to satisfy my cravings for wet pets. I had about 45 freshwater tanks there to maintain, stock, and sell. I was quite the over zealous kid. No used car salesperson here, people trusted by enthusiasm. I continued to read books and magazines, as the Internet was not yet. By spending most of my paycheck using my store discount, I would develop my own library of books. By listening to customer issues, I learned a lot. By assisting their livestock purchases, I spread the joy. Working around 55 gallon and 125 gallon tanks, one cannot live with only a 10 gallon starter aquarium. But, for the most part, I did. After all, I lived with my parents. That didn’t mean I couldn’t plan ahead. Even though the high school science nerd, I made my way into wood shop. A custom crafted solid oak stand would emerge. I have requested to be a Drs. Foster and Smith / www.LiveAquaria.com affiliate partner. 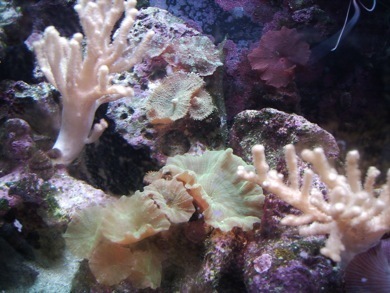 Live Aquaria has a captive breeding facility where it produces Certified Captive Grown Corals (CCGC). Enjoy the hobby, but be conservative - protect the world’s fragile reef ecosystems. Please click through this web link to order from them. It will provide me a small kickback to the help keep my hobby alive. Plus, perhaps it will be a way to help local reefers will smaller needs work together to put in special orders, again to keep the hobby alive.